We discuss the benefits, features and care of silk filled duvets and discuss the silk tog values of our duvets. What are the benefits of silk over traditional duvet fillings? During the manufacturing process layer upon layer of long fibre mulberry silk floss is placed one on top of the other. This process is repeated until the desired weight is achieved. Layering the silk creates an intricate grid design, which is key to the heat regulating function of the duvet. Because the silk floss has been layered and not stuffed into the duvet covering, the silk is able to let some heat escape through the grid design. This results in a more pleasant sleep because our body temperature is kept at a more constant temperature throughout the night. Silk has some amazing hypoallergenic properties . Silk is a natural protein and therefore is far less hospitable to dust mites which can trigger allergic reactions such as asthma, eczema and rhinitis. Up to 20,000 dust mites have been known to live in a single mattress. 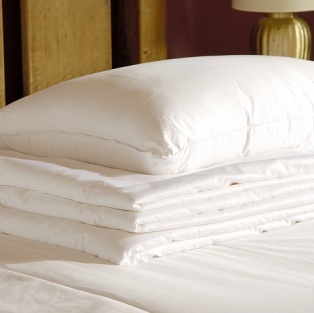 The use of silk bedding and silk filled duvets greatly reduces the amount of dust mites in the bedroom. The nature of long-strand silk fibres mean a silk duvet is just as warm but much lighter than traditional duvets, and drapes over your body instead of "suffocating" you with the bulk of a conventional duvet. Once you have experienced the softness and pure luxury of a silk duvet it is very difficult to consider using anything else. Tempted? Take a look at our range of silk duvets. Silk duvets keep you comfortable over a wider range of temperatures, unlike down or polyester which is fairly tog specific. The table below shows Silksleep duvet weights and togs. Note, duvets may be slightly heavier as the weight shown here is the weight of the silk excluding the duvet casing. Does my silk duvet require any special care? Because Silksleep duvets are made of the finest quality long fibre mulberry silk, they are less susceptible to bacteria and the cleaning requirements are far less than a conventional duvet. All the care your duvet should need when used in conjunction with a duvet cover is to be aired in the sun about twice a year. Do silk duvets have a distinctive odour? Silk, being a natural product has a distinctive odour. This can often be mistaken for a slight chemical-like smell, but is just the natural odour of pure silk. In our experience the odour can be most noticable when the duvets are first unpacked, but this dissipates after a few hours and is completely gone after a few days. Some duvet manufacturers bleach the silk before the manufacturing process to get rid of this smell. However, this totally undermines the natural properties of silk. Silksleep duvets are 100% natural, and are not manufactured using any harmful chemicals; as a result these products may have a natural silk odour. Do your silk duvets have pockets? Silksleep duvets do not have pockets. Instead the silk is tacked about every eight inches depending on the size of the duvet. This stops the silk from moving about inside the cover. Unlike down or polyester duvets, all our duvets are filled with layered long fibre mulberry silk. Because of the silk being layered and the duvet tacked during manufacture, there is very little possibility of the silk clumping inside the cover during normal use.